1989 Utopia & Ngukurr, Alcaston Gallery, Melbourne. 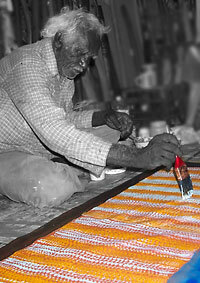 Ngundungunya Artists, Hogarth Gallery, Sydney, in conjunction with Alcaston House Gallery, Melbourne. 1993 Alcaston House Gallery, Melbourne. Australian Heritage Commission Art Award & Exhibition, Canberra. Hogarth Galleries, Sydney in conjunction with Alcaston House Gallery, Melbourne. 1996 All About Art, Alcaston House Gallery, Melbourne. 1996/97 Cafè Alcaston, in conjunction with Alcaston House Gallery, Melbourne. Beat Strit - Art of South East Arnhem Land, Alcaston Gallery, Melbourne. 1998 Recent Acquisitions, National Gallery of Victoria, Melbourne. 1999 Alawa Country, Alcaston Gallery, Melbourne. 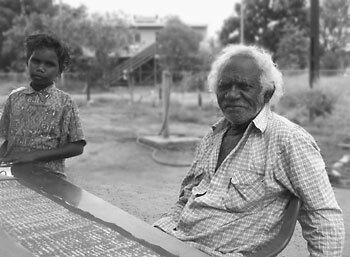 Barney Ellaga paintng at his home in Minyerri, Southern Arnhem Land (above) and at 21FirstSt (left).